You’re two hours away from an important project deadline. The pit in your stomach is growing because you’re not even close to being done. How did this happen? Over the past week, you’ve had no less than five workplace interruptions each day. You needed to respond to more than 100 emails. You had three different phone meetings that ran over an hour. Then, you got obsessed with making your project perfect. You spent time revising each paragraph, double-checking your work, and worrying about the final product. Don’t beat yourself up about what happened. Time management is a problem for everyone. But, it’s a problem you can solve. Here are four techniques to help you get the most out of your day. It’s difficult to get work done if colleagues are continually stopping by your desk to chat. If you notice your cell phone every time it buzzes, you’ll have a hard time focusing on what you’re doing. These common workplace distractions are enemies to productivity – not only for the time they take up, but for the time lost trying to get yourself back on task. To avoid them, you have to build an at-work interaction policy and communicate it clearly to your co-workers. Or better yet, develop the policy together so that you can support each other in being more productive. If you don’t need it for work, put your phone on airplane mode while you’re at the office. Check it at three predetermined times each day. Let your family and team members know exactly when those times are and tell them to contact you via your office line if there’s an emergency. Next, place some form of a Do Not Disturb sign on your desk. This clear signal will alert your colleagues that you’re busy. Just like taking your cell phone off airplane mode, take your sign down at three predetermined times each day. During these times, you can engage with colleagues, set up meetings, or work on those tasks that require less focus. What if someone approaches you despite your Do Not Disturb sign? Kindly explain that you’re not available right now and that you’d love to set up a later time to talk. If you create a habit of allowing them to interrupt you, your sign will become meaningless and you’ll be no better off. It’s easy to answer one email and then get lulled into an hour of responding to everything in your Inbox. Emails are arguably every professional’s sneakiest distraction. To avoid getting trapped, set up three times a day when you respond to emails: 9 am, 1pm, and 4pm. These strategic response times will keep you in the loop without keeping you in your Inbox. Next, disable your messenger applications and close your chat boxes. Internal chat systems are like text messages. If you pay attention to every notification, you’ll never make progress in your work. Check these apps when you check your email. The exception, of course, is if you require the internal chat system as part of your daily work. Meetings absorb a significant amount of time. More and more organizations are shifting to video conference calls and phone meetings in an effort to improve workplace efficiency. While these digital solutions certainly eliminate the need to travel to a meeting, they still have the same lack of brevity in-person meetings do. They can also create barriers to communication, which can waste time. Take control of your phone calls and phone meetings by setting firm start and end times. Prepare an outline of the questions you need to ask and stick to the outline throughout the phone call. If you notice the person you’re speaking with is getting off track, respectively redirect the conversation to your outline’s next point. Remind them you only have this specified amount of time for the conversation. At the end of the call, briefly go over your notes, recapping the points they made and confirming actions and the next meeting date, if there is to be one, and send them via email (as appropriate). Perfectionism and procrastination go hand-in-hand. When you fixate over the quality of our work, you focus so much on the project’s outcome that you don’t initiate action. When you finally do start working, you’ve already set unrealistic quality standards for the project. As a result, you might try to take on all aspects of the project yourself. You might even micromanage other members of your team, trying to force them to meet your unrealistic standards, too. 1. You burned yourself out (and potentially your team members) putting together what you see as the best possible product. 2. Your own procrastination caused you to miss your deadline entirely. 3. You pushed as hard as you could and handed in a project that’s partially great and partially mediocre. Instead of reliving this pattern in your work life, start with acceptance. Your project will not be perfect, nor are you the authority on what perfection is. Work is fundamentally collaborative. To do a great job on a particular project, let go of your unrealistic expectations and engage with your team members. This can be applied to managing our time and productivity as well. 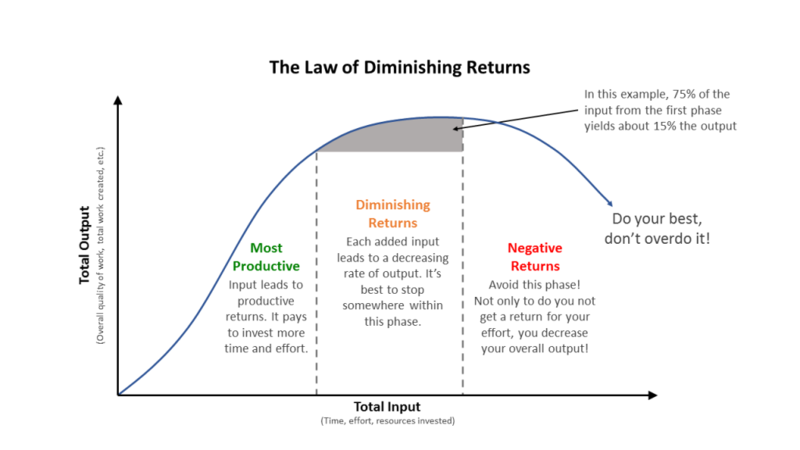 The more time and effort you put into a project, the less value you are getting out of it. Let’s say you’re writing an important report. Over the course of three days, you’ve written the report, validated the data, added charts and graphs, double-checked spelling and grammar, created a cover page, and asked a colleague to proof-read it. On the fourth day, you re-worded minor phrases, reformatted the cover page, added a couple images, changed the heading styles, and tweaked the image captions. The reality is that you were much more productive in the first three days than in the final day. You could have saved yourself some time if you had stopped fiddling with the report hours earlier, as the quality of your report didn’t improve much on the fourth day. If you had continued to edit and tweak the report for several more days, trying to make sure it was truly perfect, your productivity would yield negative returns because your other projects are being put off in favour of what boils down to “busy work”. Perfectionism can be a significant obstacle to time management. Do you want to squeeze more time out of your day? Do you hate the stress and delayed deadlines that procrastination causes? You’re not alone. Time management issues transcend all industries and all levels of executive status. Time management can be learned and improved with the right training. 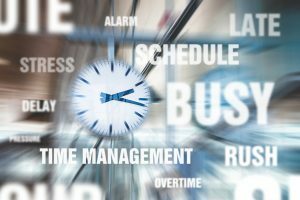 Learn how to manage your workload, prioritize day-to-day tasks, juggle multiple priorities, and overcome obstacles to successful time management with our Practical Time and Workload Management course. To transform your approach to work and increase your productivity, sign up for this two-day workshop today.